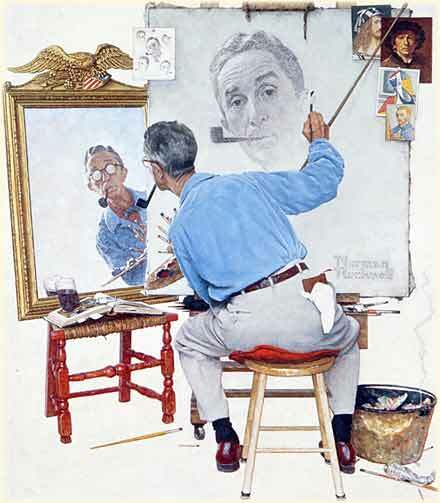 Norman Rockwell was born in New York City in 1894. In 1908 he enrolled in the New York School of Art. Then in 1910 he left high school and then went study art at the National Academy of Design but he soon transferred to the Art Students League. At the Art students League he studied with Thomas Fogarty and George Bridgman. They prepared him for his long career. He painted his fist commission of four Christmas cards before he turned sixteen. And then was hired by Boys� Life, the official publication of the boy scouts of America. In 1916 Rockwell painted his first cover for The Saturday Evening Post. Rockwell would paint 321 covers for The Saturday Evening Post over the course of the next 47 years. It was in 1943 that Rockwell painted his Four Freedoms; Freedom of speech, Freedom to worship, Freedom from Want, and Freedom from fear. The Four freedoms toured the US and raised more than $130 million for the war effort. In 1943 a fire destroyed his studio and many of his paintings. In 1953 Rockwell�s wife Mary Barstow Rockwell died unexpectedly. In 1960 Rockwell published his autobiography, My Adventure as an illustrator. Six years later he ended his association with the Post. He started work for look magazine. In failing health Rockwell was awarded the Presidential Medal of Freedom. Just a year later on November 8, 1978 he died in his home in Stockbridge, Massachusetts.